Dimensions 0.50 by 9 by 11 in. 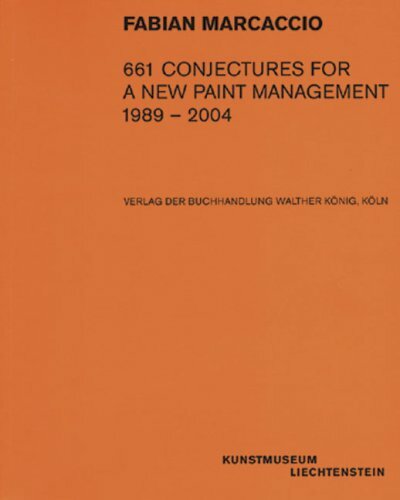 Amazon.com description: Product Description: In 661 Conjectures for a New Paint Management, the first of two volumes that complement but don't require each other, Argentine artist Fabian Marcaccio presents 661 actual-size, black-and-white drawings made over the past 15 years. These serve as a kind of DNA for his massive "paintants," in whose sweeping, curving canvases the artist seeks a new paradigm for art, since, as he says here, we've arrived at "a place beyond the exhaustion of late modernism." About: In 661 Conjectures for a New Paint Management, the first of two volumes that complement but don't require each other, Argentine artist Fabian Marcaccio presents 661 actual-size, black-and-white drawings made over the past 15 years.